More than 8 lac people have been displaced from North Waziristan since May 2014. Most of the people came to Bannu, Laki Marwat and nearby districts for shelter. PIMA doctors welcomed the IDPs on North Waziristan road for medical care. Initially a mobile camp was set there and started medical relief activities. Later on, a PIMA member dedicated a floor of his hospital for free medical treatment of IDPs. In the last week of June, PIMA established 3 static centres in Bannu and Laki Marwat. PIMA President Prof Sohail Akhtar participated in a meeting with Al-Khidmat at Peshawar on 21 June. 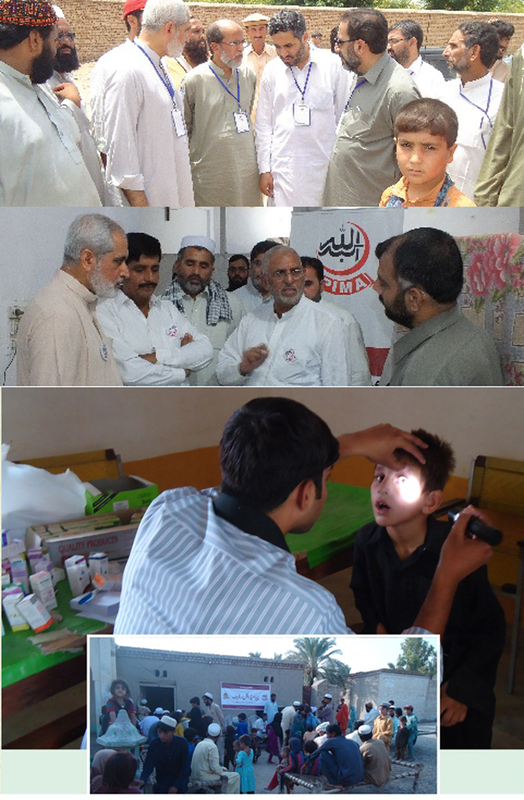 It was decided to collaborate with Al-khidmat’s field hospital and mobile clinics for doctors and medicines. Incharge PIMA Relief Dr Muhammad Shafqat Javed and Secretary PIMA Punjab Dr Tariq Ismail visited Bannu to overview the medical relief work on 6th July. Afterward PIMA relief activities have expanded to Bannu, Dera Ismail Khan, Laki Marwat and Karak. Bannu Health Complex, Peshawar Medical Centre and Saray Norang clinics were working as PIMA static centers for IDPs where free ultrasound, Xray and laboratory facilities were also provided to IDPs. A five members’ team comprising of 1 doctor, 2 paramedics and 2 volunteers has held mobile camps on daily basis till February 2015. PIMA specialist doctors from Peshawar, Kohat, Faisalabad, Multan, Rawalpindi and Lahore participated in weekly specialists’ camps which are arranged on every Sunday. Provincial president PIMA KPK, Dr Kamran Hassan and secretary Dr Fakhr e Alam also visited many time to Bannu and Lakki Marwat and observed the relief activities.